Mafiascene.com - View topic - PC audio devices! Help! Posted: Mon Nov 06, 2017 7:59 pm Post subject: PC audio devices! Help! Hi all, I've been having some problems recently with other application sound not playing when Pro Tools is open, and having Googled the issue it seems to be something to do with Windows using the software as the default playback device. 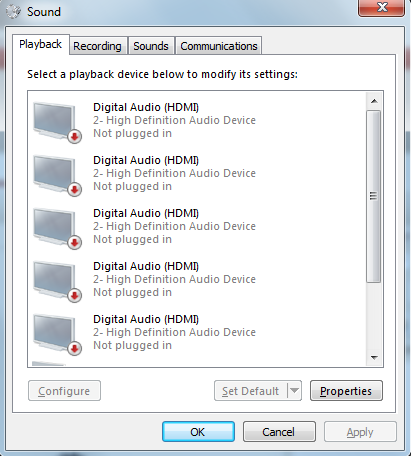 One of the results I found told me to solve this by assigning the PC's sound card as the default playback device, but when I went to open the list of playback devices I discovered FIVE of the same listed devices, as well as my back output jack ('speakers') and my front output jack ('headphones'). Any ideas what these are/how I can rid of these permanently? When I uninstall all audio drivers and troubleshoot, Windows seems to think I need all five of the above identical devices reinstalled. Additionally, how can I identify which one is the sound card so I can set it as default? Is it even listed here? Posted: Mon Nov 06, 2017 11:59 pm Post subject: PC audio devices! Help! no point having as I have 5.1 surround speakers. and Sound" and then click on "Device Manager"
if onboard sound whatever that is. tab and then Device Installation Settings. realistic icons for your devices? HD Audio; neither Geforce Experience. Posted: Tue Nov 07, 2017 2:52 am Post subject: Re: PC audio devices! Help! Posted: Tue Nov 07, 2017 7:33 am Post subject: PC audio devices! Help!